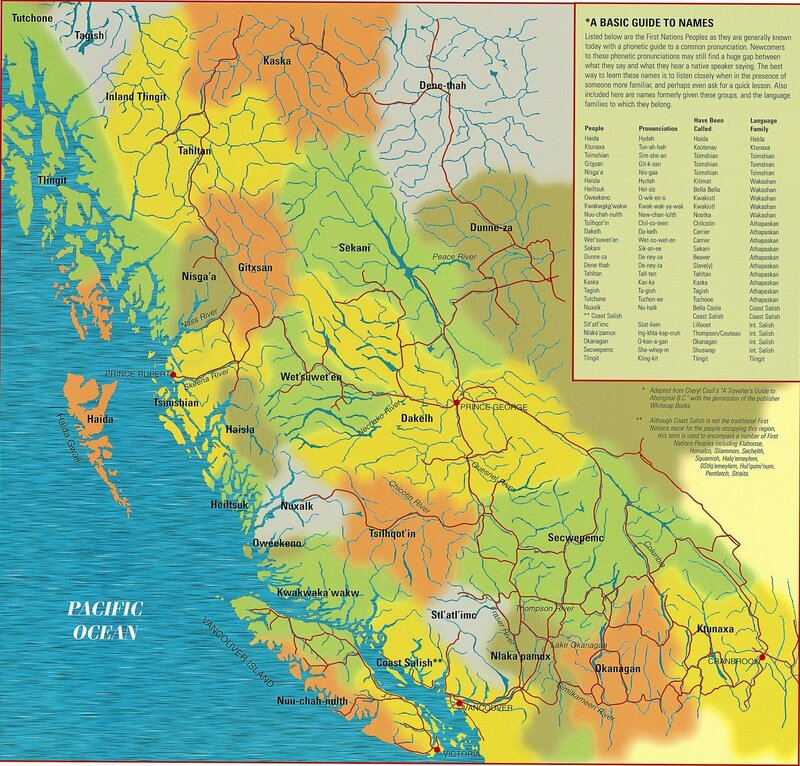 If you ever find yourself in Vancouver and you visit the Museum of Anthropology and you find yourself staring at the BC First Nations map, the one piece of information that often stuns you is that British Columbia has more culturally distinct First Nations than anywhere else in Canada. Think of Europe. Every country – France, England, Spain, Poland, Estonia, Germany, Slovakia, you name it – they each have their own cultural identity with their own language, their own customs, their own history, their own artistic identity. BC, in many ways, is like Europe when it comes to its indigenous cultures. “First Nations” is the umbrella term for all BC’s native communities, in the same way that “European” is the umbrella term for all the different countries that call the continent of Europe home. For every unique country in Europe with its own language, artistic tradition, history, etc., BC has the same kind of diversity amongst its First Nations groups, with their own distinct languages, their own distinct cultural traditions, their own distinct artistic representations, their own distinct histories, and so on. It’s fascinating and incredible and always flying under the radar. Do people even realize this? I don’t think so. Hence the map*, to give you a sense of the diversity of BC’s First Nations. I admit, I am not an expert in BC’s First Nations cultures, but I deeply respect their unique, distinct cultures as a part of the living, breathing, present-day fabric of British Columbia. Recognizing this wealth of culture and tradition is merely part of the battle, and I encourage everyone to explore and learn more about who I’ve always considered the true stewards of this land I call home. True! About 1/3 of all Indian Bands are also in BC. A number of very rich and diverse cultures.